Advanced Vapor Technologies provides steam vapor sanitation systems for the indoor environment. The MONDOVAP 2400 Steam Vapor System, TANCS equipped. This “continuous” steam vapor system by Advanced Vapor Technologies, allows you to disinfect, deodorize, and clean using high temperature, low moisture “dry” steam vapor. The versatility of the steam vapor system is unmatched by any other sanitation system. It can be used on walls, ceilings, glass, carpets, furniture, tile and stone floors, drains, coolers, HVAC heat exchangers, and all types of equipment. Great for deep cleaning and deodorizing restroom facilities, reducing water use, chemical use and their offensive residues. Call for a FREE demonstration - 800-997-6584. Meese Orbitron Dunne Co. manufactures linen and laundry handling carts, trucks, containers and accessories. MOD pioneered the design and development of the majority of bulk linen and laundry carts in use today. Though universally respected as the industry leader, MOD has continued to innovate with the introduction of several new bulk trucks that are as visually stunning as they are practical and durable. The MOD 90PSL series bulk linen truck, for example, features a breakthrough design that combines the double protection of a solid rooftop and durable, lockable doors with the versatility of a roundtripper suitable for both clean linen delivery and for soiled linen pick up and return. Its solid split top closes to protect linens during storage and transport. When opened, the split top invites easy, ergonomic access to the clean or soiled goods. When ready for return, the two plastic shelves are easily slid into a vertical position by one person, transforming the delivery cart into a bulk truck. The new MOD 100P bulk linen truck features a breakthrough internal rib design and steel-top ring that nearly doubles the strength, structural integrity and load bearing capacity of the cart vs. other carts on comparable footprints. Originally developed for a major Florida resort company, bowing out at the top rim under extreme loads is virtually impossible. Engineered using state-of-the-art 3-D solid modeling technology, it handles overloads to 700 lbs. A recessed safety tow hitch protects staff and walls and saves space in storage. It’s available for one-way and roundtrip service. Along with a host of other bulk linen carts and trucks, MOD offers a complete range of baskets and hampers in classic canvas and puncture-proof vinyl – all in a wide range of colors and sizes. For details, specifications, and free downloadable literature, see www.MODLaundry.com. International Manufacturer of Chemical Specialty Maintenance Products. Spartan's Consume Drop in a Drain voted most Innovative New Chemical Product. Spartan Chemical Company, Inc., Maumee, Ohio received the award for the most Innovative New Chemical Product at the ISSA Show in Las Vegas. Spartan's Consume Drop in a Drain received the most votes from Distributors, Facility Service Providers and other end users. Spartan Chemical Company, Inc. is an international manufacturer of a full line of speciality products for commercial, institutional and industrial accounts. Spartan Chemical products are sold exclusively in all fifty states through authorized distributors. TECNI-QUIP carts for EVS collection are available in a variety of model/ sizes combinations. Your choice of either fiberglass or aluminum. Each model is specialized for the collection of soiled or biohazardous material. All models of carts are fire-retardant, and, meet Health Care’s Joint Commission Standards for the collection and transport of waste, Biohazardous, Recycling and soiled linen. SIZES: TECNI-QUIP offers the largest carts available on the marketplace as well as the smallest. There are 10 standard sizes ranging from 90 cubic feet to the models holding just 36 cubic feet. Other sizes- that features everything in between- is offered. Select from a variety of décor color choices as well as professional labeling. TQ GUARD: Protect employees and keep carts ultra clean, with the addition of our TQ GUARD protective ingredient. This agent is permanently added to the resin in the construction of fiberglass carts and lasts a lifetime. Kills all Bacteria, Mold and Mildew on contact! NEED A SPECIAL SIZE OR STYLE OF CART? – no problem! We are committed to providing you with the cart you need 100%. Features can be added to standard models or custom carts can be built from anodized aluminum. There are no additional costs associated with custom carts or special features. HISTORY: In 2003, we are celebrating our 42nd year in the business of manufacturing quality carts and covers. All parts and materials are made in the USA. TECNI-QUIP’s manufacturing and sales offices are centrally located in Texas. Office hours are 7:30 AM – 6:00 PM Central Standard Time. 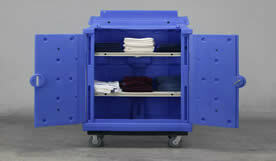 TECNI-QUIP also manufactures a quality line of linen carts,mobile wire shelving and cart covers. Please visit our web site for photos on all models and features at www.tqind.com or call us at: 800- 826- 1245 or local at: 830-401-4400. The Royce Rolls Ringer Company, producers of high quality housekeeping equipment since 1925, offers a complete line of stainless steel housekeeping equipment and restroom fixtures. Besides providing facilities with the durable stainless steel mop buckets, wringers, utility carts, and housekeeping carts, Royce Rolls also manufactures toilet paper dispensers, paper towel holders, trash receptacles, wall panels, shelves, kick plates, sanitary napkin receptacles, diaper bins, and corner guards. All made out of type 304 Stainless Steel, products are durable and built to last. Each includes a 10 year guarantee against breakage. Kaivac develops science-based hygienic green cleaning systems that protect the health of building occupants while raising the value of cleaning operations. All of our cleaning technologies are designed from the start to remove the maximum amount of potentially harmful soils and bio-pollution in the most cost-efficient manner possible. In fact, Kaivac’s No-Touch Cleaning systems are scientifically proven to be 60 times more effective in reducing bacterial contamination than mops, which are more likely to spread contaminants than remove them. Just as important, Kaivac incorporates scientific measurement into its systems to ensure hygienic outcomes for total facility wellness. Because, when it comes to potentially harmful microbial contamination, it’s important that you remove it, then prove it. 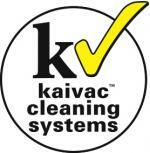 Kaivac No-Touch Cleaning™ systems combine automatic chemical metering and injection, an indoor pressure washer, and a powerful wet vacuum into an integrated system. No-Touch Cleaning™ systems empower workers to deep clean and sanitize without ever having to touch soiled, contaminated surfaces. They not only clean better, but also cut labor, chemical and equipment costs while raising worker morale and image. Dial's reputation for quality spans more than 100 years. Dial bar soap is America’s best-selling, and is # 1 in consumer loyalty at home. No bar soap is trusted more for effectiveness and protection. Dial® Basics is a mild, gentle cleansing soap made of naturally derived ingredients, ideal for the whole family. The hypoallergenic formula is dermatologist-tested and does not contain any harsh chemicals, heavy perfumes or other additives which can irritate the skin. Tone® soap is the only leading skin care bar with cocoa butter, a natural moisturizing ingredient that helps skin retain its natural moisture levels. Tone soap’s mild formula and pleasing fragrance make it ideal for everyday skin care. Breck® shampoo, conditioner, and conditioning shampoo formulas are enriched with aloe vera and are suitable for all hair types. Specially formulated for mildness, all Breck products are ideal for everyday use. This spa-inspired amenity line, with its stylish packaging and enticing fragrance complements any room decor and provides guests with a soothing experience. 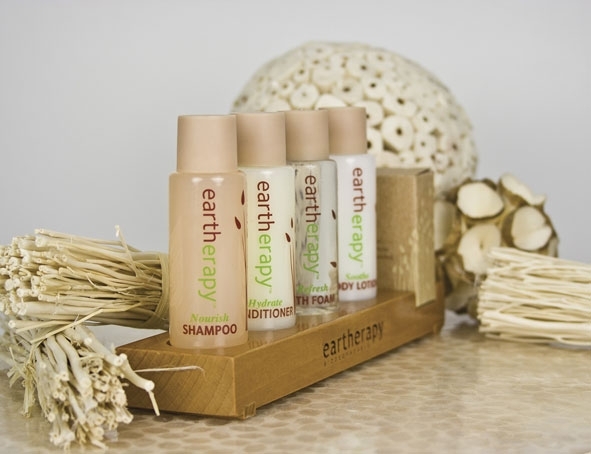 Restore Amenities offer the highest caliber of ingredients to ensure that guests will return time and time again. Customer satisfaction is drastically affected by both the appearance and true state of your facility’s cleanliness. Impeccable cleanliness is a non-negotiable element in your facility’s bottom line performance. 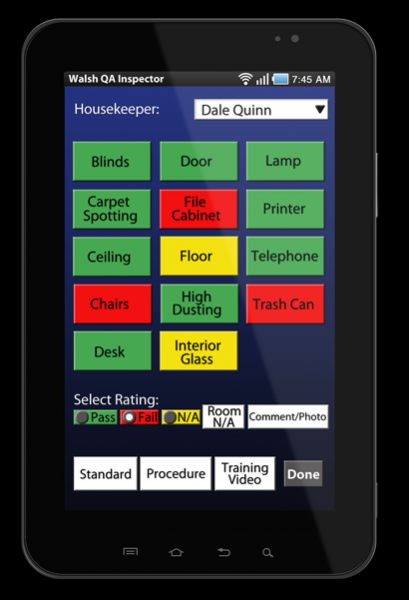 Walsh QA Inspector is a mobile system that tracks and manages your cleanliness QA Inspections. This easy to use program is fully customized to your facility’s blueprints, staff and checklist requirements. You will be able to follow open issues until completion, send out work requests, include photos during inspections, automatically generate reports in minutes and much more. This cost saving technology helps you improve quality and cleanliness, increasing your performance and customer satisfaction. Walsh Integrated creates mobile and web solutions that automate your entire inspection process. We provide technology that lets you easily track, analyze and interpret your findings. Our systems free you to focus on improving quality instead of chasing paper. Walsh applications service the needs of many different disciplines in many different industries including: Healthcare, Hospitality, Education, Government, Construction and many more. 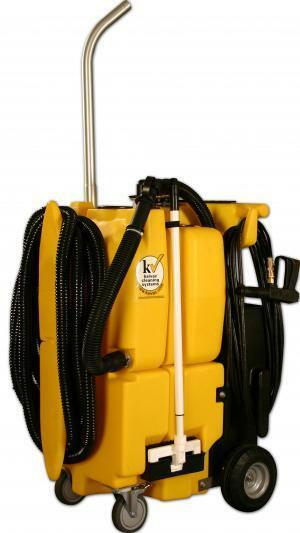 30 plus years ago, ProTeam® became a global phenomenon in the commercial cleaning world after introducing a game-changing design innovation, the lightweight backpack vacuum. Scientific studies and maintenance crews consistently find ProTeam vacuums improve worker productivity, effectiveness, and ergonomic comfort. ProTeam vacuums extract and eliminate more dust, dirt, and allergens. 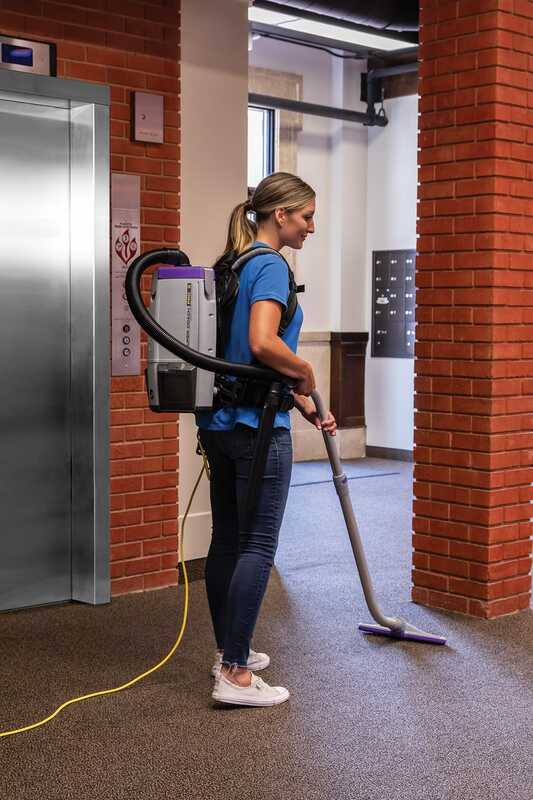 Today, ProTeam offers a full range of innovative vacuums designed to tackle every cleaning situation, including canisters, uprights, wet/drys and the world’s best-selling backpacks. With the industry’s leading runtime on a cordless backpack vacuum, the GoFree® Flex Pro, and productive ProBlade floor tools, the legacy of innovation continues. Anderson Chemical Company creates chemical cleaning systems for institutional and industrial (I&I) housekeeping, kitchen and laundry needs under the INTEGRA® and DOSE™ brands. Anderson Chemical Company is a 100-year-old family enterprise, now in its fourth generation. Anderson’s mand ate is – and always will be – to make safe, easy to use and high performance products for the I&I markets. INTEGRA®’s patented kitchen and laundry systems are engineered to deliver maximum cleaning performance with top quality products. INTEGRA® Systems are closed systems to provide safety and are customized to fit your individual needs. 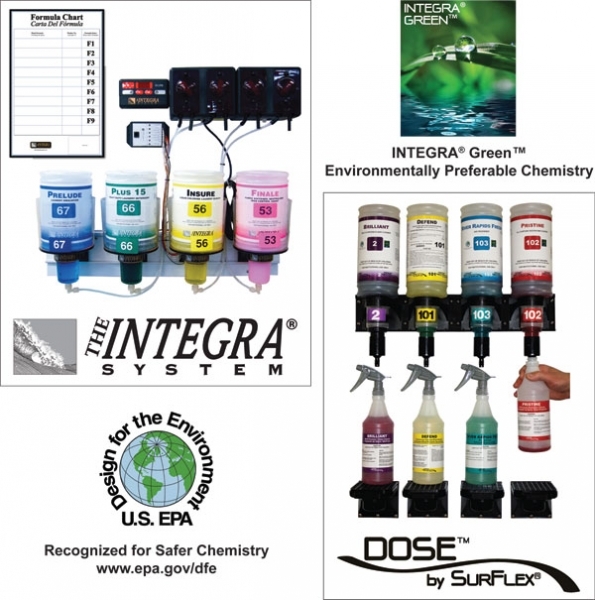 Many INTEGRA® and DOSE™ products are listed with the Environmental Protection Agency’s (EPA) Design for the Environment (DfE) program for safer chemistry. In 1997, Anderson designed the first complete laundry system to be recognized under DfE guidelines. Anderson’s latest design innovation is the DOSE™ by SURFLEX® line of housekeeping products. The accuracy and ease of use engineered into DOSE™ systems makes DOSE™ a winning option. DOSE™ by SURFLEX® systems are unique because they do not require water hook up. This benefits you, because DOSE™ dispensers can be placed wherever YOU need them, not just where water is available. To get more information on how The INTEGRA Program® or the DOSE™ by SURFLEX® system can help meet your cleaning challenges, call 1-800-366-2477, e-mail us at integra@accomn.com or visit our website at www.theintegraprogram.com. Concept = Innovation. Innovation = the key to staying ahead of your opposition. creation of memorable guest experiences. A company of many firsts; from nourishing shampoo to sachet and pleat wrapped wrap soaps, ERP™, eco-friendly luxury, all-in one grooming kits and complete dental kits. Constantly evolving; near enough is never good enough. At the heart of our operation is a highly automated state-of-the art manufacturing facility—where nothing is left to chance. From design and formulation through to production, dispatch and delivery, we ensure quality and global supply continuity. In sync with the hospitality industry, we are strongly conscious of our environmental impact and the growing eco-consciousness of guests. Planet stewardship is a fundamental expression of our values, from minimizing waste to developing eco-friendly products and initiatives that change people’s lives—we strive to make a real difference. Together let’s make Sensory Indulgences; Luxury; Wellness and Sustainability key words for your Company. Janitized® brand vacuum bags and filters are the industry’s first and most comprehensive line of replacement “commercial grade” filters available today. Janitized® brand replacement vacuum bags and filters for commercial cleaning: Providing the highest Filtration Efficiency for indoor air quality (IAQ), worker safety and environmental clean air requirements compared to OEM vacuum bags and filters. Backed by the industries first Blue Ribbon Product Warranty and Gold Seal Shipping Guarantee. Janitized® Biodegradable vacuum bags received nomination from ISSA’s Innovation Awards for best new “Green” product. We are committed to new product developments being introduced each year. All products are backed by the industries first Blue Ribbon Product Warranty and Gold Seal Shipping Guarantee. 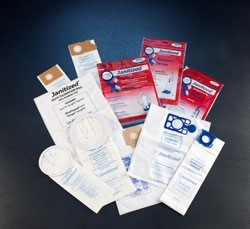 To learn more about the family of Janitized® products visit www.janitized.com to download free literature, see our complete product line or call us toll free at 1-888-689-1235. Ronna Timpa, founder and president of Workplace ESL Solutions, has taught thousands of hotel employees over the past 20 years, providing hotel-specific English skills to existing and potential employees in the hospitality industry. This online English language program teaches housekeepers, public area attendants, janitors and other cleaning staff hotel specific English in a fun and entertaining way. There are videos, games, activities and listening/speaking lessons as well as hotel specific vocabulary in every unit. There are 15 units, so there are hours and hours of learning opportunities for only $99 per person. Cleaning companies can buy "licenses" for their employees and then track their progress. Ronna Timpa is helping change the world, "one housekeeper at a time."